Lock in a great price for The Bull Inn – rated 8.2 by recent guests! Nice room, friendly, helpful staff. Great breakfast. The staff welcomed us at the check in and at every opportunity. We ate breakfast and dinner at the hotel for 2 days. Food well prepared and fairly priced. For a 500 year old property the accommodations were comfortable. Rooms were very clean and there were plenty of fluffy towels. Location in the town was easy to get around. The car park was small but we always found a spot to park in. Friendly staff, size of my room was great. Very central location. Great value and location, excellent service, clean warm rooms (we were there during the snow) and best breakfast had in a while. Its an old coaching inn so building is bit quirky but don’t let that put you off. loved the location and there was parking which we appreciated as it is difficult in this town to do so. The staff that we interacted with were very nice indeed. Fantastic sausages for breakfast. Room was perfect, clean and very comfy bed. Staff very friendly, food in the restaurant was amazing. Also had friends and family stay at the hotel, the weekend was a great success. Staff were excellent. Manager even moved us to a ground-floor room with a walk in shower when we realized that the upper level floors were a bit uneven and the steps a bit difficult to navigate. It is a 17th century inn so it is to be expected. They could not have been any more accommodating! Cooked breakfast was delicious and freshly cooked by the chef. The Bull Inn This rating is a reflection of how the property compares to the industry standard when it comes to price, facilities and services available. It's based on a self-evaluation by the property. Use this rating to help choose your stay! Blend modern decor with the period features, all rooms have a TV and tea/coffee making facilities. Many have views of the courtyard or Market Hill. The Bull Restaurant offers a selection of British and international dishes, including a traditional Sunday lunch. The Savoia cafe bar offers light meals and coffees as well as cocktails and wines. Free Wi-Fi and free on-site parking are available. The Sports Bar shows live matches on its TV and the Bull has an entertainment schedule which includes karaoke. Woodbridge is a small country town on the Deben River, 8 miles from central Ipswich. Sutton Hoo ancient burial mounds are less than a 10 minute drive away and the seashore is 15 miles away. 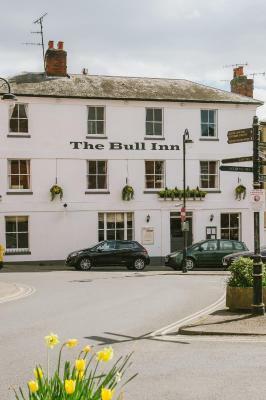 When would you like to stay at The Bull Inn? Features include a TV, tea and coffee making facilities, and an private bathroom. Spacious rooms with luxurious furnishings including a traditional four-poster bed. Large room with sitting area and luxurious furnishings. House Rules The Bull Inn takes special requests – add in the next step! The Bull Inn accepts these cards and reserves the right to temporarily hold an amount prior to arrival. Please note that not all rooms can accommodate children/additional guests. If your requirements are for more than 2 people per room, please check the availability before booking. Quite over priced, one of the 3 single beds was just a load of springs, so uncomfortable not a lot of sleep had. Location was great. Staff were friendly. Breakfast-eggs were well cooked-a good test of a chef. All staff very friendly. NB major refurb going on. Lack of restaurant facilities and slow service at breakfast. Bed was a bit soft for me. Can't think of anything. Don't change it. Excellent breakfast and location. Delightful owners and staff. General comfortable homely atmosphere. Would go there again and again. Comfortable bed and friendly staff. Brand new owners starting to upgrade. Very open to feedback and ideas. Wonderfull Central location. Has free car park and that's were we left the car all weekend. Can walk everywhere and very scenic. My wife did struggle to get in and out of the bath as it was quite high, but then again She is 5ft nothing! Haha Seriously though, we couldn't fault anything. Being woken up at 0730 by workmen in the next room. The "morning" staff couldn't wait to clear our breakfast plates as soon as our knives and forks were put down. The breakfast itself looked appetising but that's where the illusion ended. The mushrooms in particular were dreadful. Black pudding was tasteless, need I go on. Spoons for cereals need throwing out, followed by the toaster that obviously has not been cleaned for years (if ever). Maybe it's because there is ongoing work, but the whole staircase has not seen a vacuum cleaner in ages. Overall, this could be a very nice place to stay once it has been renovated completely. The reception on arrival was very good. The bathroom in our room was very nice. The location was excellent for my work trip. The walk in shower was very nice. The bed was nice and the pillows were comfy. The breakfast was very nice to start the day. They did have the football available on sky, so happy. The room wasn’t great, there were noises pretty much throughout the night, pipes or something but a constant knocking meant for very little sleep after a 7 hour drive to get there and the same back next day. The location was lovely. The staff were very friendly.